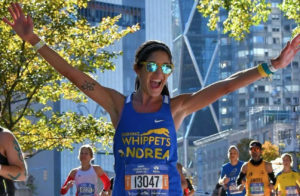 Learn more about Andrea, one of our runners on team Tell Every Amazing Lady® for the 2019 NYC Half Marathon! 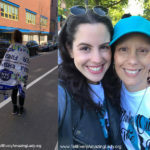 I am very excited to join T.E.A.L.® (Tell Every Amazing Lady About Ovarian Cancer) for United Airlines New York City Half Marathon 2019. 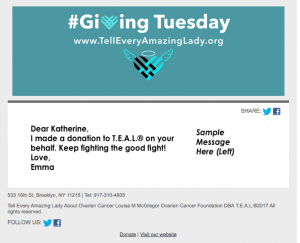 I became interested in fundraising to find a cure for ovarian cancer when I got introduced to the field of genetic counseling. Carriers of a BRCA gene mutation face a lifetime risk of ovarian cancer between 10-60 percent. Genetic counseling and testing is the best way to identify hereditary ovarian cancer risk, especially in families with a strong history and prevalence of ovarian cancer and breast cancer. The psychological stress introduced by genetic diagnosis of cancer can be overwhelming. 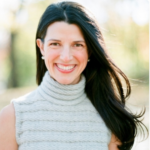 I have learned through my research career at Northwell Health however, that patients can take preventative care for their children who may be at risk.